When we send you home with your bright puppy, we will also be sending a “Going Home Packet” with you as well. Small bag of the puppy food your pup is used to. If you want to use another high-quality pup food, transition slowly, mixing both for a couple of weeks, finally discontinuing use of the food Crossfield sends you. Your puppy’s current vaccination/worming/health record. A toy with which your puppy and litter-mates have played. This gift will smell like your pup and litter-mates which can make the transition to a permanent home easier. We recommend you replace this toy with a sturdy dog-chew toy within a couple of days of bringing your new puppy home. But you may want to keep it for later on! It may become his favorite toy in a year or so! Lifetime support if you have questions. 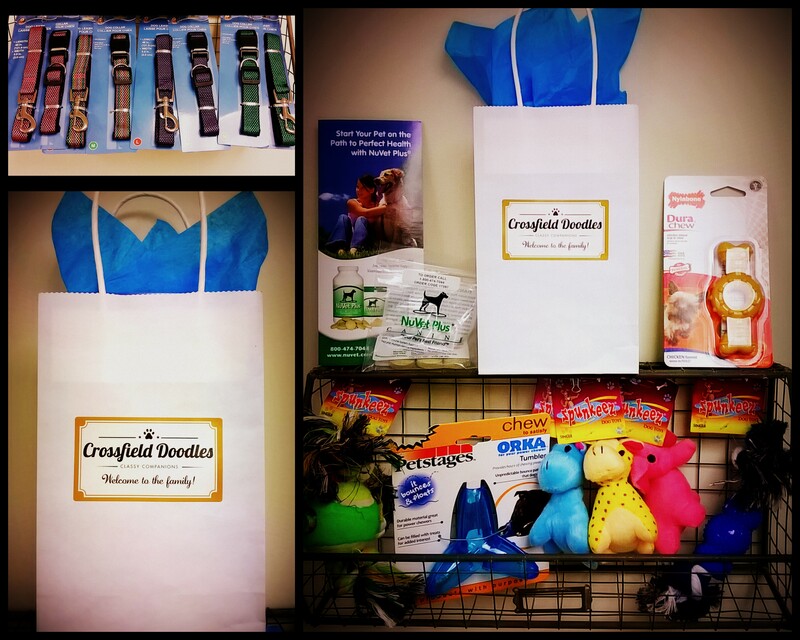 This is our way of welcoming you to the Crossfield Doodle Family! You are as important to us after you make you purchase as you were before, so let’s continue the conversation in the future!